Your 3rd birthday wishes can be as precious and special as your favorite pint-sized birthday boy or girl. 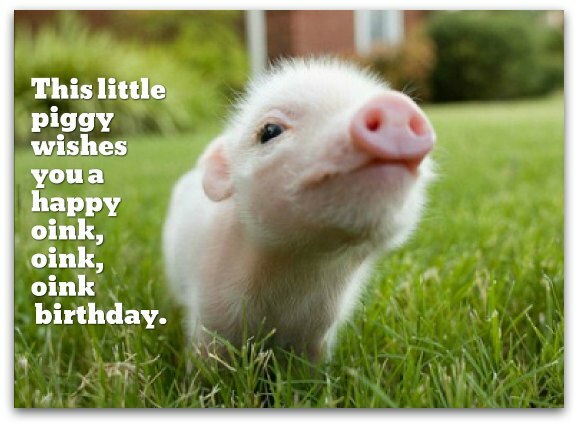 Here, find the oh-so-cutest, one-of-a-kind birthday messages for 3 year olds. Plus, all the 3rd birthday greetings on this page are parent-approved (so to speak), meaning that they are exactly what Mom and dad would love to read to their child after the party or aloud to everyone at their little tyke's birthday celebration. 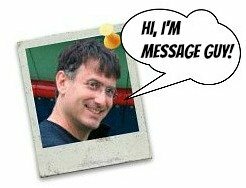 Want some help with choosing the best messages? Below are just the right birthday greetings for any 3-year-old toddler. You're sure to find one that expresses exactly what you would like to say...to his or her parents (since, after all, your 3-year-old birthday boy or girl can't read yet, so your message is really for his or her parents). Need some help? Take a look at the hints here (the tips are for picking 1st birthday wishes but apply to messages for 3 year olds too). Know why you’re so special today? It’s your special day, your birthday. You’ve just turned 3 years old today. Wow! Happy 3rd birthday! You turned three today. Do you know what that means? You are three times a little lady! Happy 3rd birthday! Wow, you’re growing up so quickly. You’re already 3 years old today! It just seems like yesterday you were 3 days old. Happy 3rd birthday! Any 3 year old would love the wish below read to them by their mother or father. Why? This is one of those 3rd birthday wishes that speak the same way as a three year old, so it's cute and very appropriate for any toddler celebrating his or her 3rd birthday (and it's just right for his or her parents, who will, after all, read the message). Turning 1 or 2 is cool! Turning 3, though, is super, super, super cool! Have a super cool 3rd birthday...as cool as you are! You deserve three cheers. That’s because you’re 3 years old today. Hip, hip, hooray! Hip, hip, hooray! Hip, hip, hooray! Happy 3rd birthday! For your birthday, you should get at least three of everything — three hugs, three kisses and three birthday candles with three birthday wishes. That's because you're 3 years old. Happy 3rd birthday! May your 3rd birthday make you three times as happy as your happiest day ever (with lots and lots of cake and gifts, hooray)! Need to check out more samples? This year, your third birthday will be full of friends, fun and gifts! Happy 3rd birthday! On your 3rd birthday, you should have at least three balloons to make your birthday party three times more the blast. Happy, happy, happy 3rd birthday! Hoping your 3rd birthday is three times as amazing as your first two (with three times as many gifts and cake). Happy 3rd birthday! (on their birthday and every day)? Compliment them for simply being part of the family. Compliment contributions to the family. Compliment the quality of their work. Compliment the effort, even when the result is not the best. Compliment when they achieve something new. Compliment their sense of style, even if we don’t exactly share their taste. Compliment steps toward a long-term goal. Have an incredibly scrumdelicious 3rd birthday! 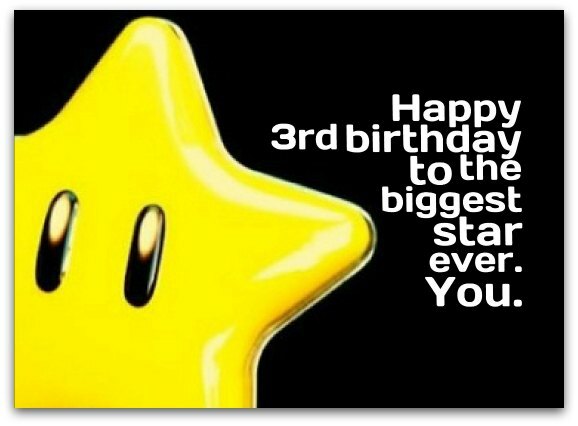 Have a super-duper-duper-duper 3rd birthday! Hoping your three birthday wishes come true. After all, you're turning 3 years old today! Happy 3rd birthday! When you turn 3 years old, three things happen to you — you become three times as cute, smart and fun. Happy 3rd birthday! Today, forget about the ABCs. It’s all about 1-2-3 birthday wishes. May all yours come true. Happy 3rd birthday! 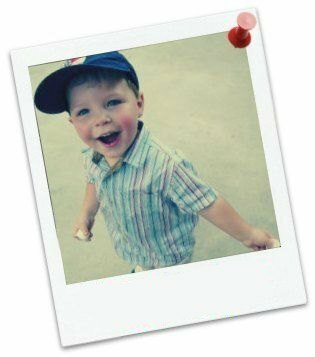 Now that you're THREE — you're Terrific, Handsome, Rambunctious, Extraordinary and Energetic. Happy 3rd birthday!